Hang gliding is the realization of man’s oldest dream…to fly. Not long ago, kings would have given their entire fortune to be able to fly like a bird. Today, thanks to the work of Francis Rogallo, the Father of Hang Gliding, and many others, people of all walks of life take to the air on a daily basis. From the time of the ill-fated flight of Icarus to the turn-of-the-century pioneers of the sport, such as Otto Lilienthal, Octave Chanute and John Montgomery, man has attempted free flight in just about every phase of modern history. As the Wright Brothers continued their pursuit of powered flight, they honed their flying skills in "hang gliders". After their famed Kitty Hawk flight, the world became increasing interested in the technological advances of powered flight, leaving hang gliding for another generation. 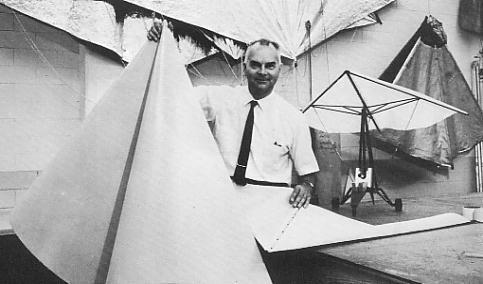 Drawing from the ideas of Leonardo da Vinci, Otto Lilienthal, and the Wright Brothers; Mr. Rogallo, an aeronautical engineer for NASA, created the first flexible wing in the late 1940’s. The wing was unique in that it was inexpensive and easy to build and although it could be deployed like a parachute, it could also glide forward and be steered. The original wing had a glide ratio of 3:1 which meant that for every foot it dropped it would fly three feet forward. The design was revolutionary at the time and although it was used by NASA and the military, it would eventually become famous for its original intent – foot launched personal powerless aviation or hang gliding. 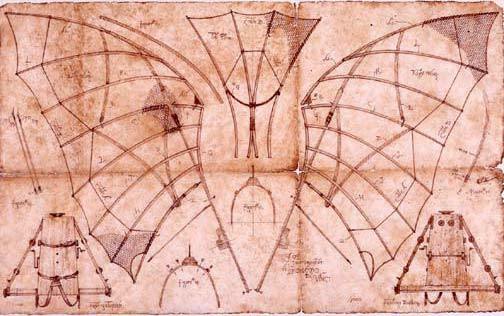 Paragliding&apos;s origins can be traced back to Da Vinci’s parachute drawings during the Renaissance as well as to the modifications to the parachutes of the WWII era. The probable inventor of the airfoil paraglider is David Barish who made “sail wings” for recovery of NASA space capsules and foot-launched his wings at US ski areas in the mid-60’s. The rich free-flight history of paragliding and hang gliding illustrates the human interest in flying like a bird. The modern day hang glider incorporates modern technology of high tech design and instrumentation. Hang gliders today must pass stringent "load" tests and are certified for their airworthiness. Pilots fly with altimeters, variometers, reserve parachutes and even on-deck flight computers. Flights of 100 to 200 miles are not uncommon, with Manfred Ruhmer of Austria establishing a world distance record of 435 miles from Zapata, Texas, on July 17, 2001. Modern-day paragliding started in the U.S. and in Europe with the idea of launching skydiving parachutes off steep mountains slopes and gliding down to land at the bottom. 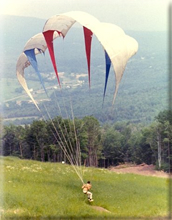 The first pioneering foot-launched flights on gliding parachutes were made during the mid-1960&apos;s by David Barish in the U.S. The sport of recreational paragliding as we know it today was born in Mieussy, France, in 1978 and grew rapidly during the mid-1980&apos;s in the French and Swiss Alps as commercial manufacturers improved the glider designs to optimize them for soaring flight. Paragliding reached various areas of the U.S. in the mid-to-late 1980&apos;s and most of the growth of paragliding in the US occurred during the 1990&apos;s. Brazilian pilots Marcelo Prieto, Frank Brown and Rafael Saladini flew their paragliders a straight distance of 461.6km in Quixada-Duque on November 14, 2007, which is currently being ratified as the new world record.